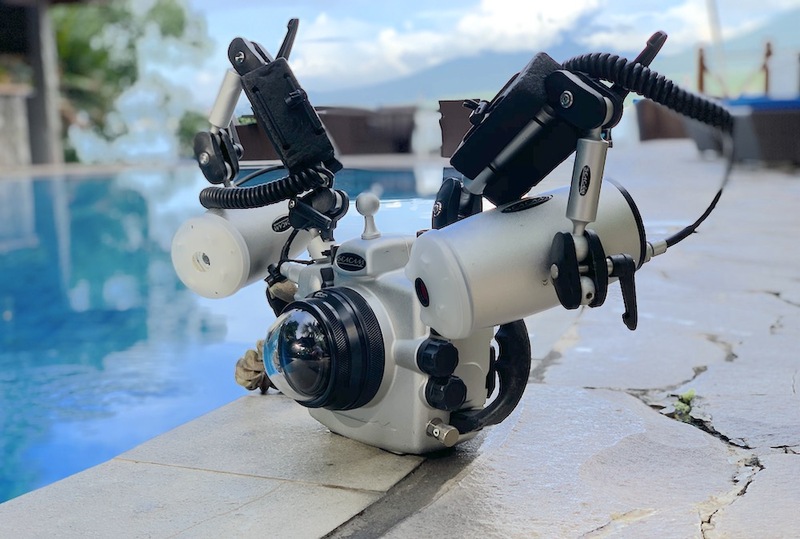 Capturing Critters in Lembeh is the biggest Underwater Photography event in the Lembeh Strait and is attended by Photographers and Videographers from all over the World. The 2018 event was our 7th annual workshop and this year we were delighted to welcome Brandi Mueller, Tobias Friedrich and Lilian Koh as our visiting Photo & Video Pro’s. 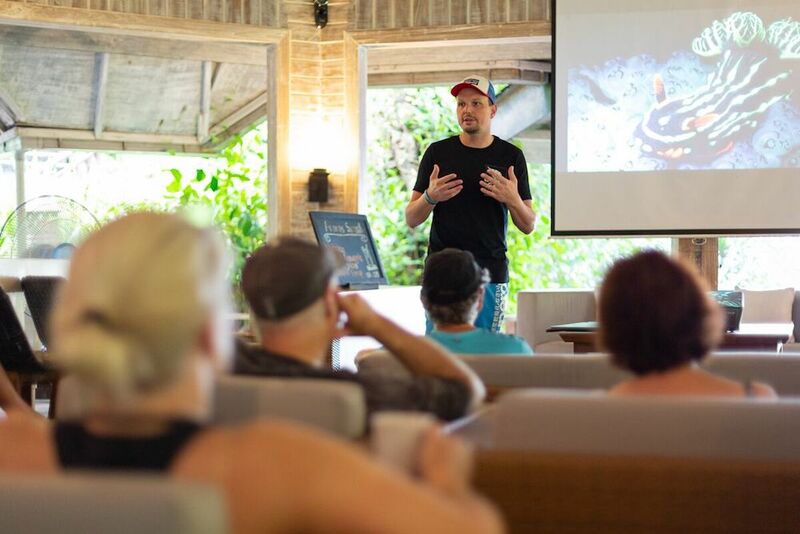 Please read on below for more detailed insight into how an Underwater Photography Workshop is conducted at Lembeh Resort. 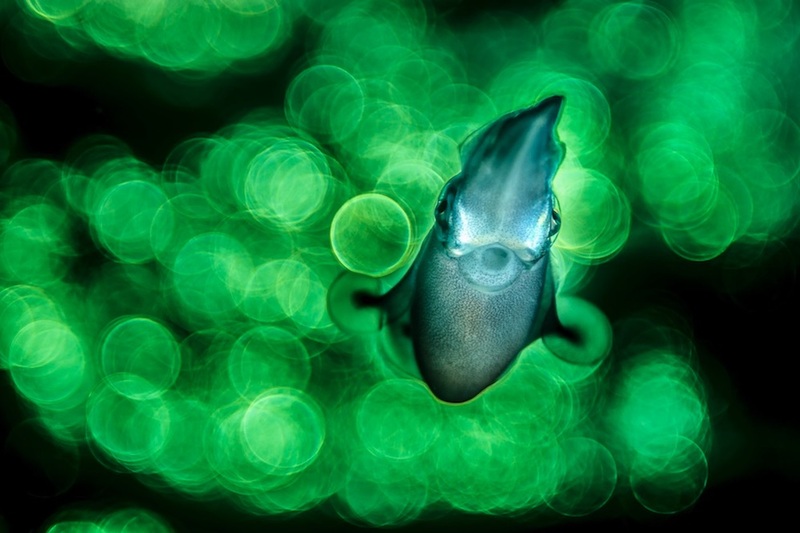 Capturing Critters is a week long workshop in which participants enjoy phenomenal diving here in the Lembeh Strait in addition to daily workshops from the visiting pros and evening one-on-one critique sessions. Over the course of the last six years we have seen just how much photographers’ skills can soar in these intensive seven day events. We also offer a 3 day extension for those who want to develop their skills even further. We are all very excited to see the stunning imagery which we are sure will be captured this week. This year’s workshop includes some exciting additions to previous years. 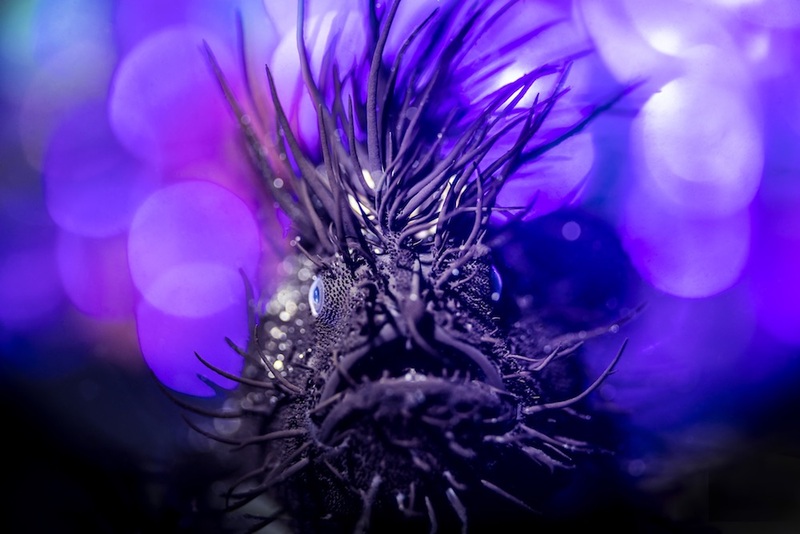 Participants will be able to experience “blackwater diving” which will enable them to capture images of the pelagic critters which migrate from the deep to the shallows at night – these species are seldom seen by most divers and photographers. 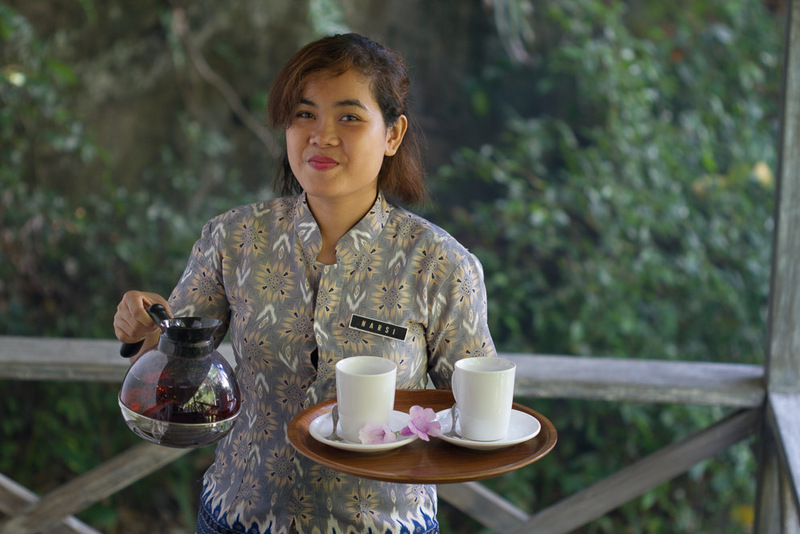 Of course, it wouldn’t be a Lembeh Resort workshop without some special touches along the way. Follow our daily posts to find out what other surprises we have in store for participants throughout the event. 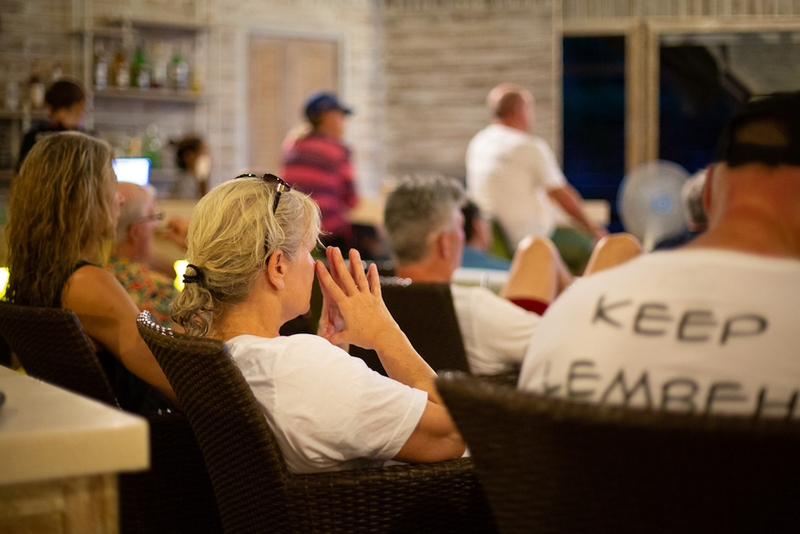 Today there is a buzz of excitement among our team of dive guides who have been briefed and are excited to get out into the Strait tomorrow to spot Lembeh’s most unusual marine life. 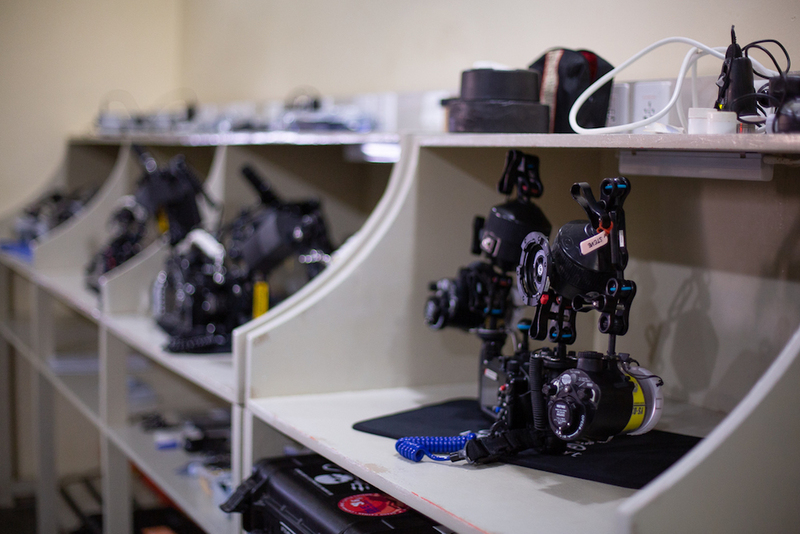 The camera room is ready for the participants’ rigs; our boat crews have primed the dedicated workshop boats and are ready to welcome all aboard; and in the resort, our kitchen crew and restaurant team are looking forward to serving up some Lembeh Resort delights. Before dinner this evening we held our welcoming gathering and we are now looking forward to an early night in readiness for what promises to be an exciting day of diving tomorrow! 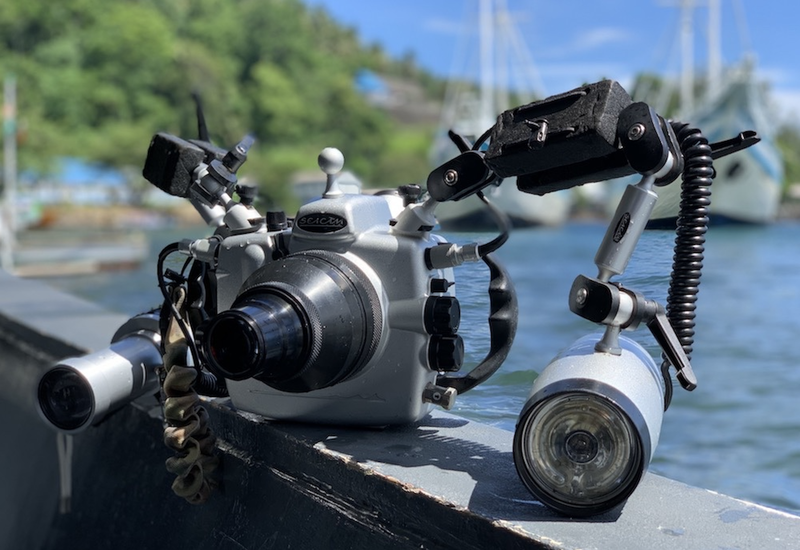 It’s the first day of the Capturing Critters in Lembeh Workshop and we are getting ready for some phenomenal underwater photography dives in the Lembeh Strait. Any Photo Pro will tell you that the key to success is proper preparation. There is no better way to prepare for a day of shooting in Lembeh than with a Lembeh Resort breakfast. Participants got to see for themselves this morning why our breakfasts are so popular; freshly brewed coffee or tea and a selection of juices; home baked breads and pastries; cereals; yogurts; European cold cuts and cheeses; Indonesian Ayurvedic herbal shots; a selection of tropical fruits; and of course, our delicious hot food options. For those who would like to enjoy traditional Indonesian flavors, our chef’s divine nasi goreng or rice noodles are a wonderful way to start the day. Our egg corner caters for those who prefer a hearty taste from home along with bacon and sausages for a complete American breakfast to get the day underway. After breakfast and an introduction to muck diving from Marine Biologist Dimpy, it was time to get the most important preparation started – in the camera room! Camera preparation can make or break a day out on the water. Preparation in Lembeh Resort Camera Room. Take your time and check all elements of your rig. Allow yourself enough time in the morning so that you can take your time when assembling your rig. If you are rushing it’s more likely that you’ll forget something or you won’t notice that stray hair on your O-ring. The most important shot that you will take each day is the shot of your lens cap, ensuring that you haven’t left it on. This will also enable you to see that your strobes are firing and all elements of your rig are working correctly. If you do not have a vacuum system, make a bubble test with your rig before boarding the boat. By holding your camera rig underwater in a rinse tank for around 1 minute you’ll be able to spot any bubbles forming, indicating a problem with an O-ring seal. 1 minute here can save you from a costly leak later in the day. With all aspects of your preparation, check, check and check again! 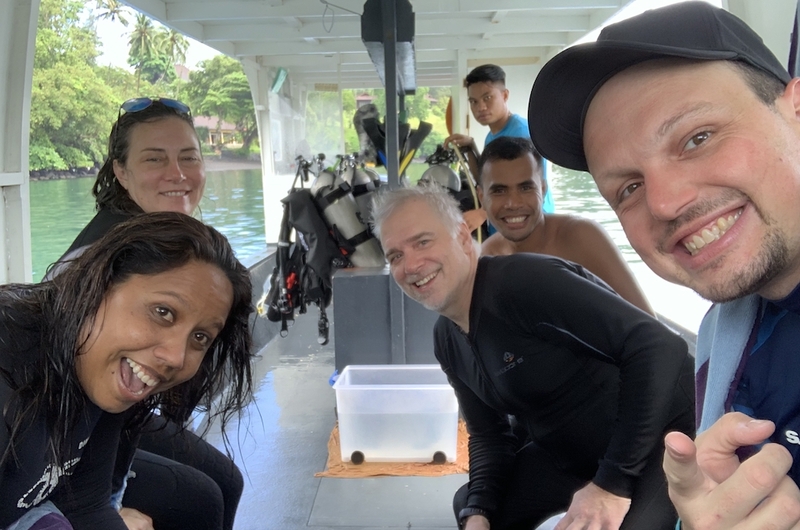 So with our preparation completed it was time to head out on the boats and enjoy a phenomenal morning of muck diving with the pro’s in the Lembeh Strait. 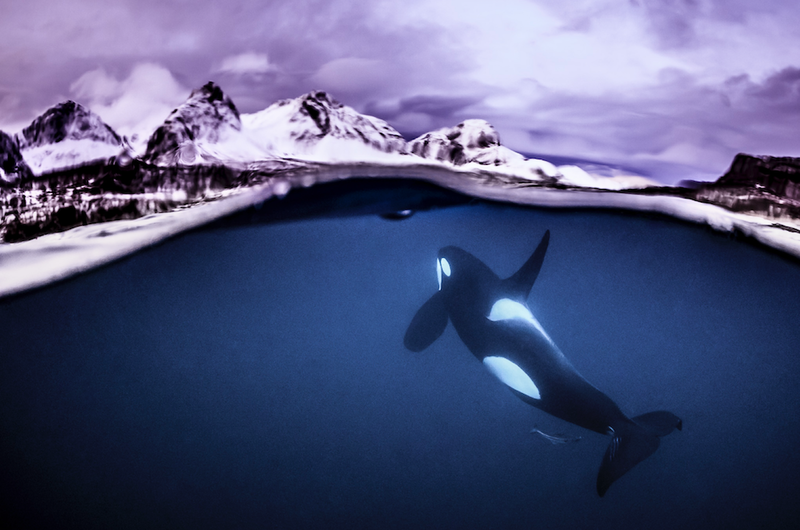 Brandi Mueller is an award winning underwater photographer who became inspired (and obsessed) by the ocean from an early age. Brandi believes in the power of an image to educate people and change their opinions and pre-conceived ideas. Brandi’s presentation “Take Photo’s, Save the World” gave participants an insight into how valuable their underwater images can be. Brandi reminded participants about the small percentage of the world’s population that are scuba divers and the even smaller percentage that take images underwater. 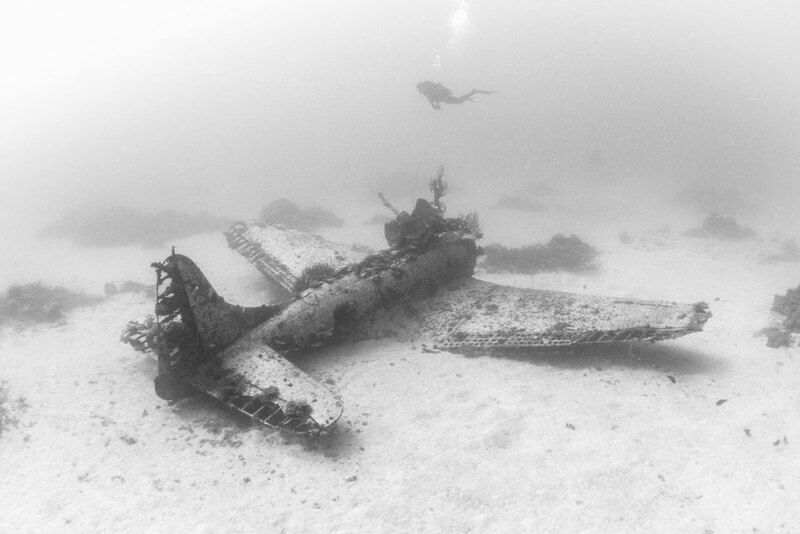 Underwater photographers enable the majority of the world’s population to see the beauty of the underwater world as well as the damage that is being inflicted on it by human kind. Through underwater imaging people can see how their actions on land affect the eco systems which exist in our oceans. 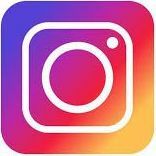 Sharing images on social media is important as it sends out the message that there is something worth saving which inspires people to try and bring about change. Underwater imaging is not only art – it’s a way of documenting what is happening in our oceans – both positive and negative. Images that show behavior are not just interesting images, they are also evidence of how some species are adapting their behaviors to cope with changes which are occurring in their environments. 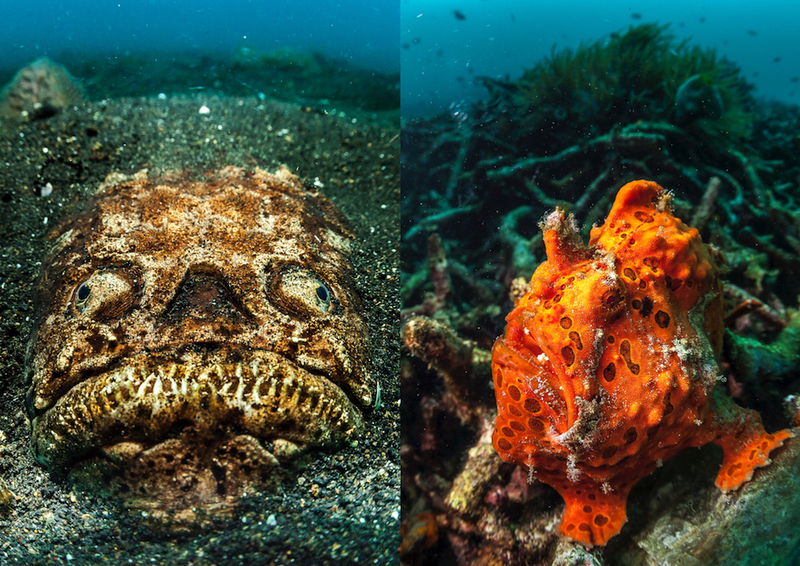 Underwater images tell the story of change and an image really does speak a thousand words. 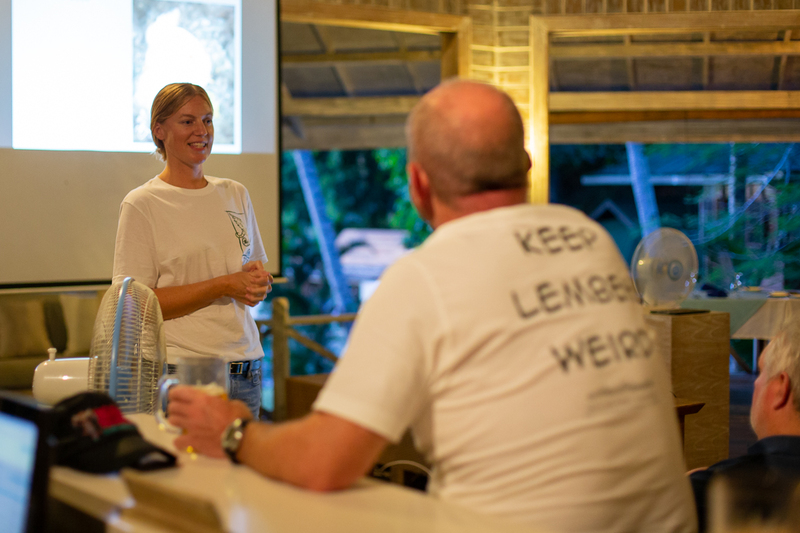 Brandi highlighted the importance of responsible photography to participants – which is something we firmly believe in at Lembeh Resort. Responsible photography includes good buoyancy, limiting bottom contact and keeping your fins up and behind you. Maintain good buoyancy. Stay off the bottom and keep your fins elevated, up and behind you. Using a pointer stick is an excellent way of limiting bottom contact. Pointer sticks are not for manipulating critters and should not be trailing. Never manipulate or move a critter. Be aware of your fins. Be aware of your strobes banging coral. Limit your number of shots and after taking your shots, back away carefully, leaving the critter as you found it. Did you miss a spot on this year’s workshop? There’s no doubt that the Capturing Critters in Lembeh Workshop schedule is busy but there’s also plenty of time “between the bubbles” for relaxing and taking some time out. Participants can also choose to opt in, or out, of as many dives and presentations as they wish. This week we have been finding out what our participants have been doing in their time “between the bubbles”. Taking time out by the pool is the perfect way to relax in between dives. The poolside bar has been busier than ever serving coffees in between dives and sundowners at the end of the day. Even our Pros (Tobias Friedrich, Lilian Koh and Brandi Mueller) have been finding time in their busy schedules to take advantage of the pool and kick back! 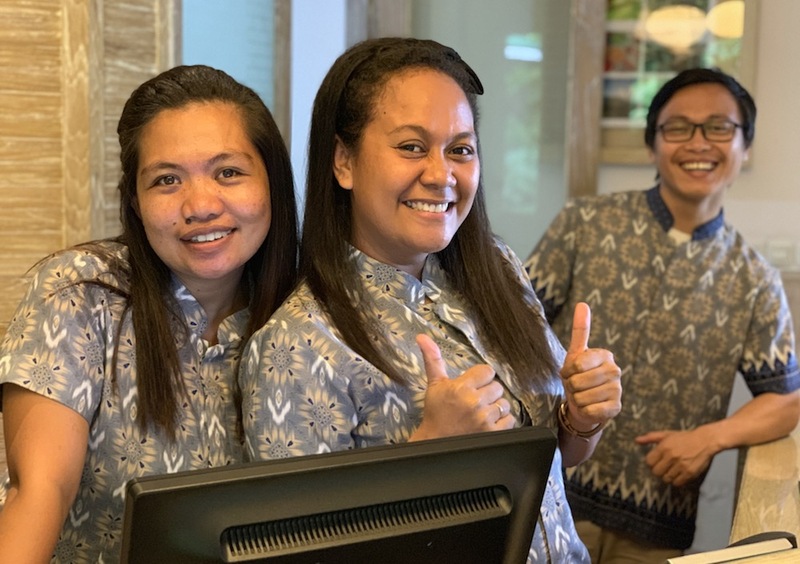 In keeping with the adage “Sleep, eat, dive, repeat”, our Lembeh Resort kitchen team have been working up a storm in the kitchen this week. Participants are making three dives a day and have the appetites to prove it. This week’s stunning buffet lunches have been a sight for sore eyes, the à la minute cooking station has been cooking delicious dishes to order and no-one has been able to resist the home made ice cream, pastries and cakes. As this is a workshop one of the most popular activities “between the bubbles” has been photo editing and our Pro’s have been on hand to help participants with their processing and image selections. Participants have been able to kick back in the restaurant with their laptops and have valuable input from all three Pro’s when it comes to editing. We are looking forward to seeing the incredible imagery which they are producing over the course of the workshop. Of course, a workshop isn’t just a workshop – it’s a holiday too and our spa therapists have been busy soothing tired muscles with massages and body treatments in the evenings. 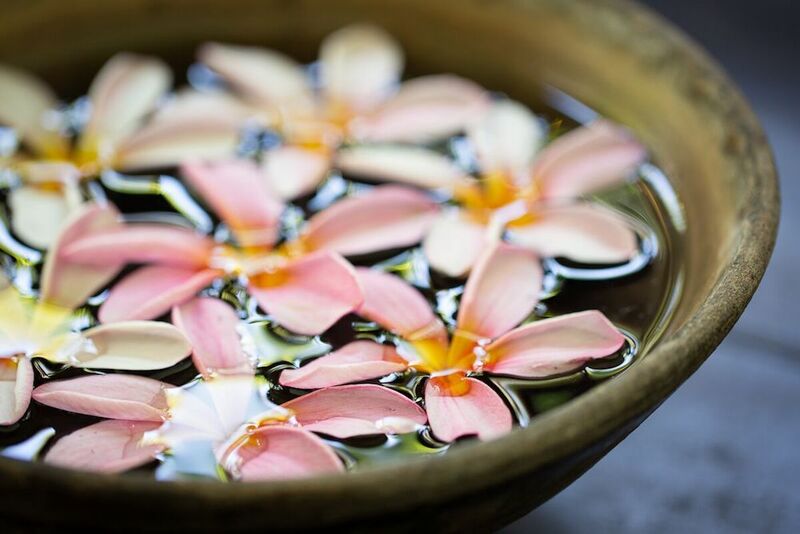 There is no better way to relax and re-energize than with a traditional massage and aromatherapy oils at the end of the day. 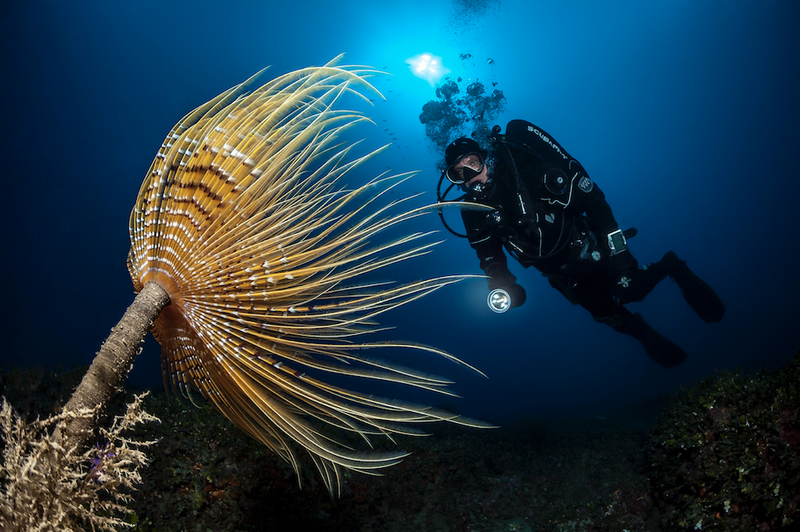 Tobias Friedrich is an award winning, underwater photographer whose images have been published in prestigious scuba diving magazines such as US SPORT DIVER, UNTERWASSER, TAUCHEN, SCUBA DIVER AUSTRALASIA and many others. How Important is a Background? In Tobias’ “Backgrounds and Bokeh” presentation he highlighted to participants how a background can make or break a picture regardless of the subject. Tobias said, “The background and the subject have to work together, either through contrasting or matching colors, different textures or negative space. The most important factor when considering backgrounds is that they must never distract from the subject, they must enhance it otherwise the subject will be lost and the image will never reach its full potential. 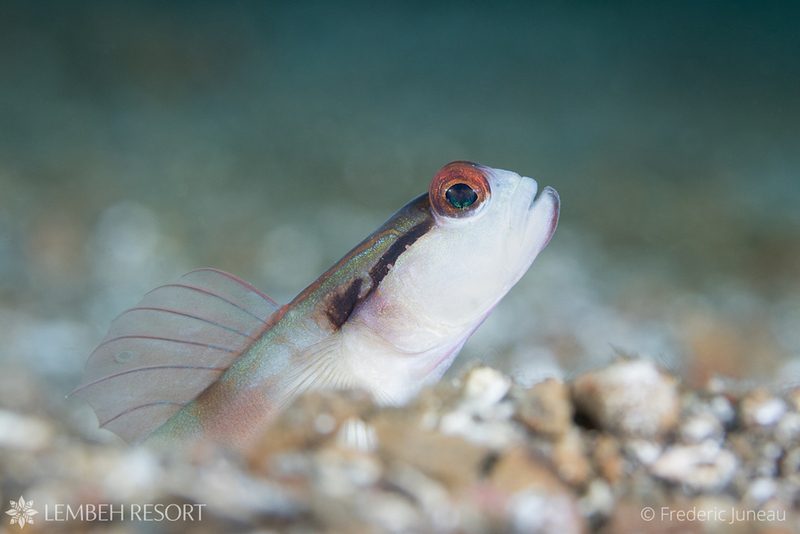 In Lembeh many of the critters are sitting on the rubble or sand which is not always attractive so we need to work harder and make the best of this”. Tobias explained about using different lighting techniques to create different background effects. Black backgrounds are useful when a critter is positioned on an unattractive background and you are relying on the artificial light from your strobes. Inward lighting, which involves positioning your strobes low down and pointing inwards, will prevent the “bad” background from being illuminated and appearing in the shot. Likewise, using a snoot to illuminate only the critter is a useful technique. 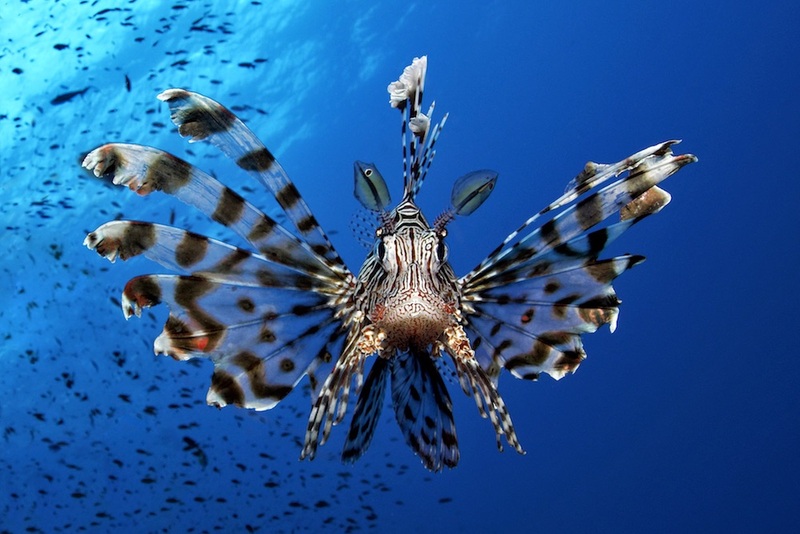 Where there is a lot of ambient light (in shallow water) try to position yourself between the critter and the reef and shoot up to capture a pleasing blue background (see lionfish image above). If it’s not possible to shoot out from the reef, aperture settings can be used to blur out busy or distracting backgrounds. More on this below. Your aperture (f-stop setting) determines the “depth of field”, which is the amount of the image in focus from front to back. When using a large aperture setting you will create more blur in the background (less depth of field). As you decrease the size of the aperture more of the background will come into focus (more depth of field). 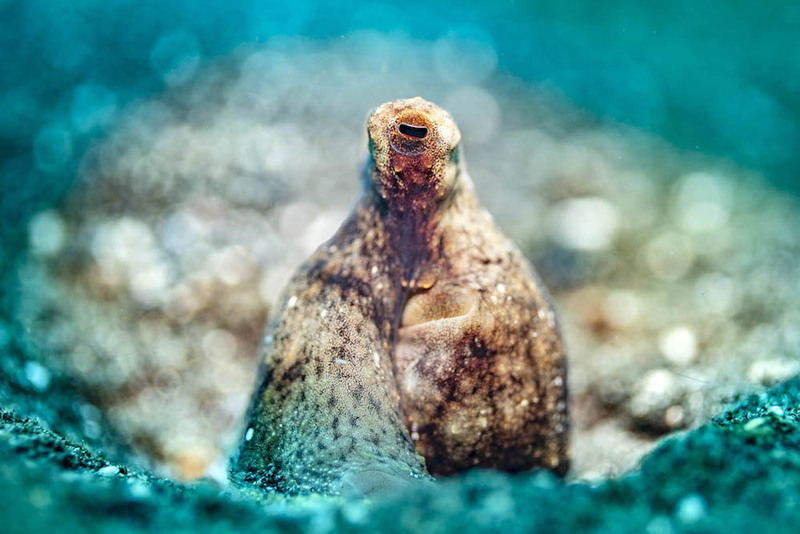 The cuttlefish image below shows a large aperture bringing the cuttlefishes eye (closest to the camera lens) into focus and creating blur as you move from front to back in the image. By using a large aperture and creating blur you can soften distracting backgrounds and it’s possible to create “Bokeh” effects. The term “Bokeh” comes from the Japanese word boke which means “blur” or “haze”, or boke-aji, the “blur quality”. 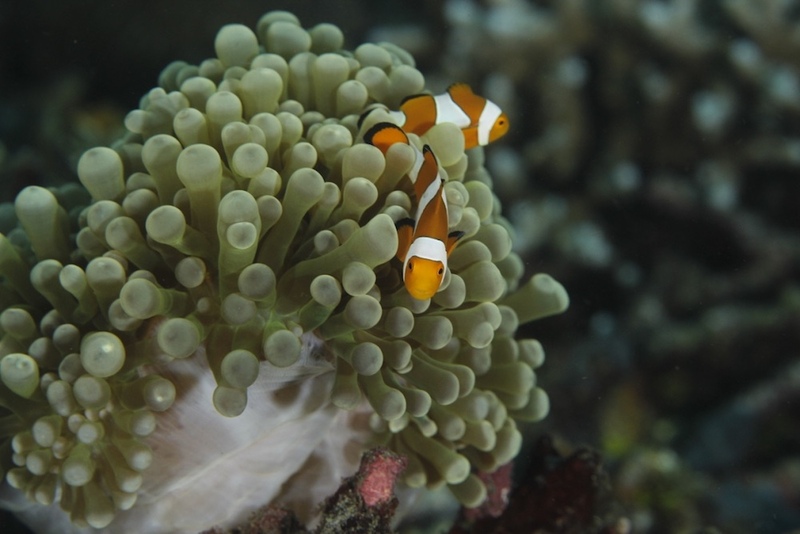 In underwater photography most Bokeh effects are characterized by circular blurred particles. Bokeh backgrounds can be based on natural backgrounds or make use of artificial backdrops and props to create artistic images. Tobias explained that Bokeh backgrounds are usually interesting and interact with the subject but without detracting from it. 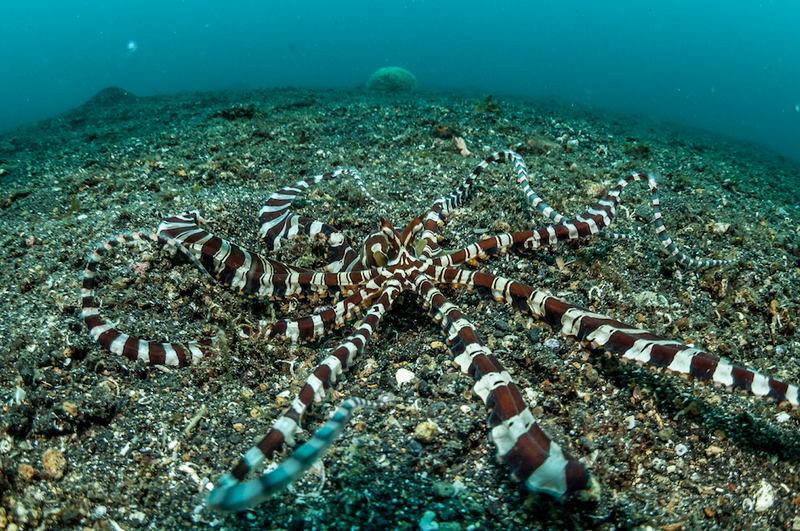 The volcanic sand which we have here in Lembeh can be used to produce a natural Bokeh effect which can be seen in the mimic octopus image above. Note the circular blurs which characterize underwater Bokeh. 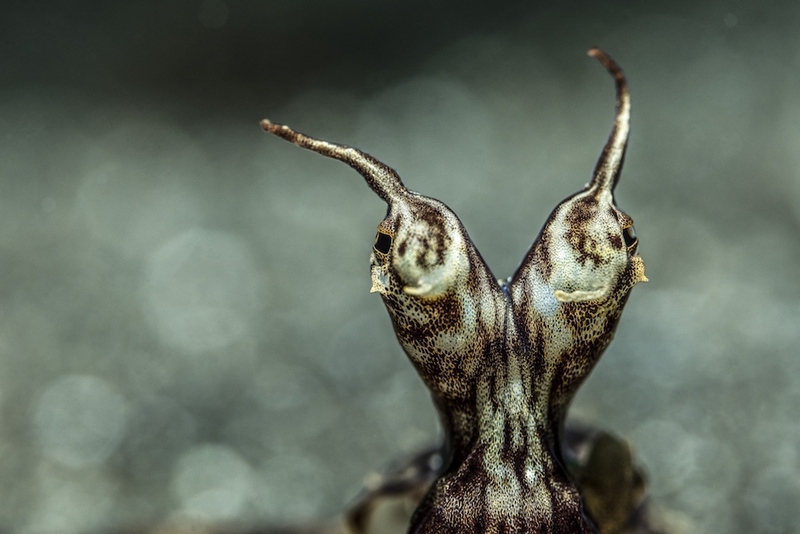 Tobias shot this image by positioning his strobes low down to the sand and shooting angled upwards to the mimic’s head. You can use artificial backgrounds behind the subject to create your own Bokeh. Curtains using either glass or plastic translucent beads work very well as they can be back lit and the light will shine through in the color of the beads. If a critter is resting on the bottom different objects (crystals or marbles work well) can be placed behind the critter to create Bokeh background effects. The lower your f-stop (larger aperture) the more blur you will see, as you close the aperture you’ll find that the outline of the objects becomes apparent again so you can vary your degree of Bokeh to achieve whatever effect you are aiming for. The image above was shot with a natural background. Tobias shot the image with his camera angled upward and was able to translate the reflecting sunlight on the water into a Bokeh effect. As with any background, Tobias reminded participants that the Bokeh should still enhance the subject of the image and not become the subject of the image! 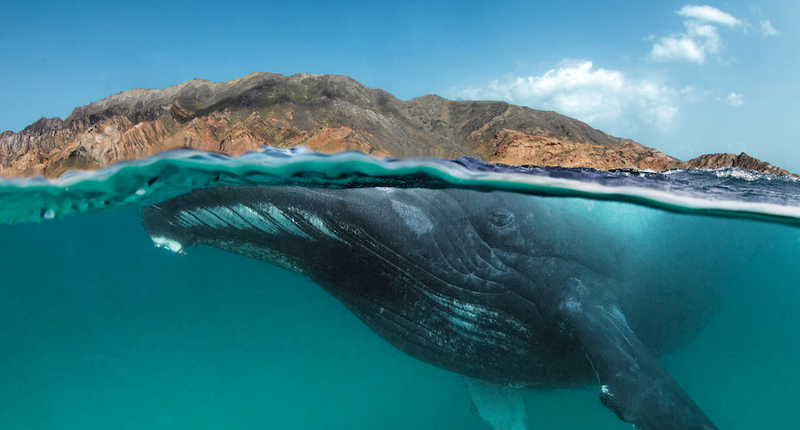 Tobias’ 2019 “Below Surface” 2019 calendar is now also available and contains 12 stunning images to keep you inspired throughout the year – also available through the Below-Surface website. During workshops the camera room opens at 5am and breakfast starts at 6.15am. This does not mean you need to be in the camera room at 5am but for those who would like to be making adjustments or working on their rigs, the room is open and breakfast is ready early. 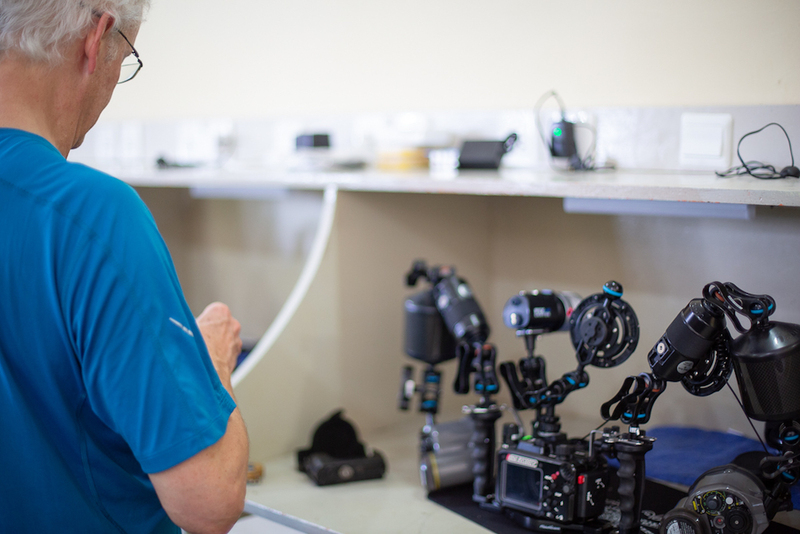 This year we have built more flexibility into the schedule to give guests more time to work on their equipment and images or to have more time to relax between dives and presentations. Morning presentations are 30 minutes long and are hosted by one of the Pro’s. The first presentation is from 7am to 7.30am. It’s entirely possible to be drinking your morning coffee and eating your breakfast while listening to what the Pro has to say! During workshops we have dedicated workshop boats so everyone on your boat will be taking part in the same event. 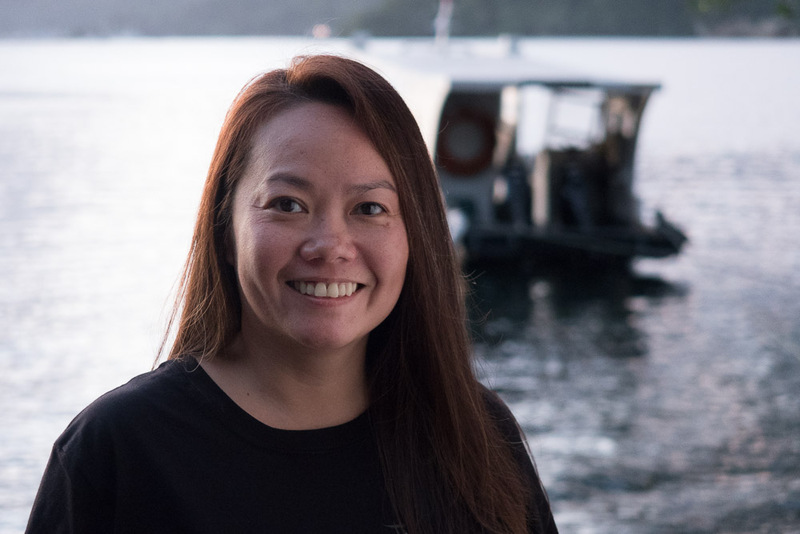 Each boat will have at least one Pro on board as well as Lembeh Resort Dive Guides and either Photo Pro, Marine Biologist or member of Lembeh management team. During workshops we usually plan for a two dive morning trip without returning to Lembeh Resort. Surface intervals are on the boat which gives you time to ask the Pro any questions you have following the first dive. During the interval you’ll also be served hot drinks, fruit and cookies. Surface intervals are a great time to get some advice which you can put into practice during the second dive! 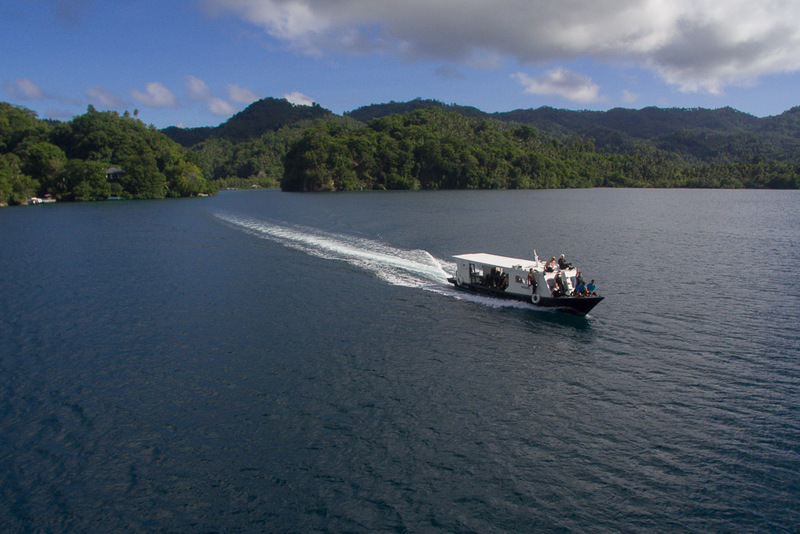 Workshop boats usually return to Lembeh Resort around 12 noon depending on which dive sites were visited. Our lunch time buffets are almost an event in their own right. A selection of hot dishes – both Asian and Western have been awaiting workshop participants upon their return. Our fresh salad bar and selection of mini plates are ideal lighter bites or complimentary to main dishes. The kitchen team have been busy this week preparing fresh fish, noodles and other tasty treats to be cooked to order on the à la minute cooking station. 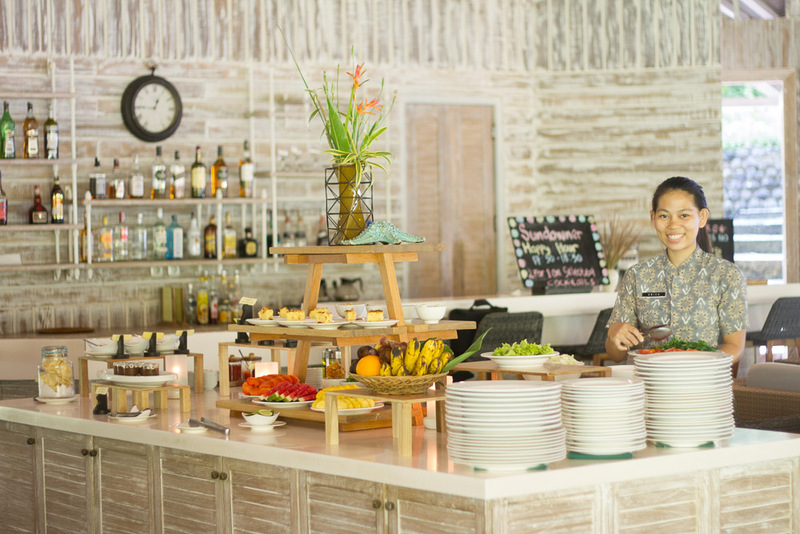 Decadent desserts including homemade ice cream, tarts and cakes have been a highlight along with fresh tropical fruit platters – the perfect end to a well deserved lunch. Following lunch, from 1.45pm to 2.15pm, participants have the option to join the second Photo Pro Presentation of the day. This week’s lunch time presentations have ranged from black water diving through to creative macro composition. 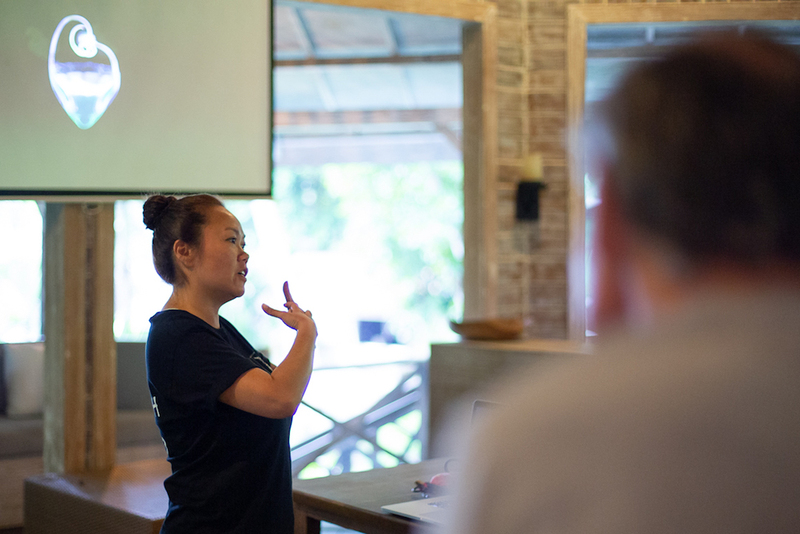 Presentation topics are varied to ensure there are topics which offer something for everyone and every level of shooter. It’s important to remember that a workshop is a holiday too. We want all participants to be able to take the workshop at their own pace and get what they want from the experience – whether that’s an intensive week of shooting or a more leisurely approach. 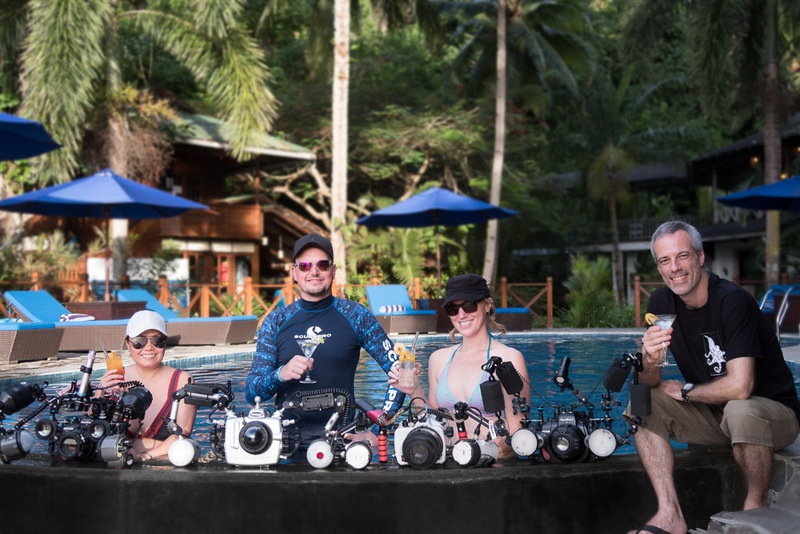 Our Lembeh Team and the Pro's all aim to inject some fun into the event too. 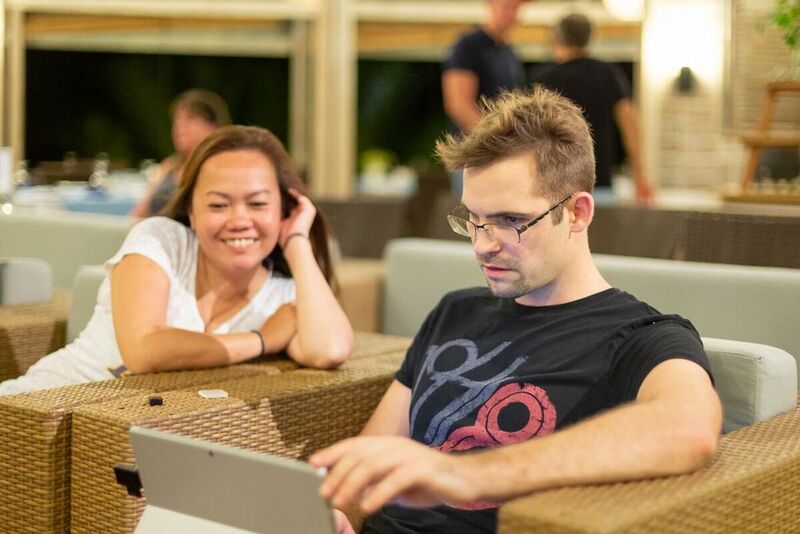 Lembeh Resort Guest Relations Manager, Morten Lund Hanson. The workshop boats have been departing for the third dive of the day at 2.30pm and these dives are a perfect opportunity to put into practice techniques discussed in the afternoon presentation. Once again the Photo Pros are on board and on hand to help participants with advice and guidance on the boat, before and after diving, as well as underwater. Workshop days are complimented in the evenings with either group critiques sessions or one on one sessions with the Pros. For participants who wish to do so, images can be submitted to the Pro’s and these will then be discussed in a group critique session. Critique sessions allow participants to learn from other participants as well as the pro’s. One on one Pro office hours allow participants individual time with the Pros to discuss their images, editing and shooting techniques. For those who are content with their day of shooting, a sunset cocktail at the pool bar or an indulgent massage in the spa is also a wonderful way to mark the end of another successful day in the Strait. After a busy day, a well deserved à la carte dinner is served in the evening. Our menu offers a soup appetizer and several choices for entrée, main course and dessert. 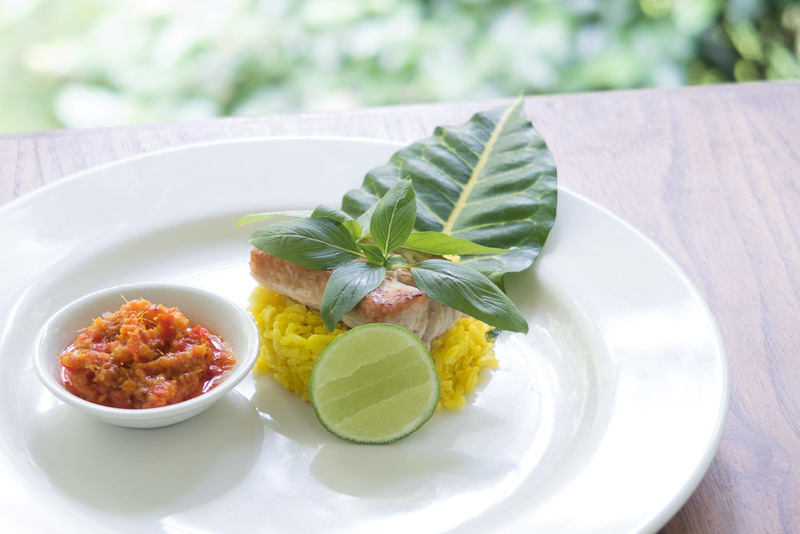 Evening menus always include vegetarian options, classic Indonesian and Western fusion fare. Evenings are a great time for participants to discuss their dives and share their favorite critter and photography stories of the day. Lilian Koh is a World Class Photo Pro from Singapore. 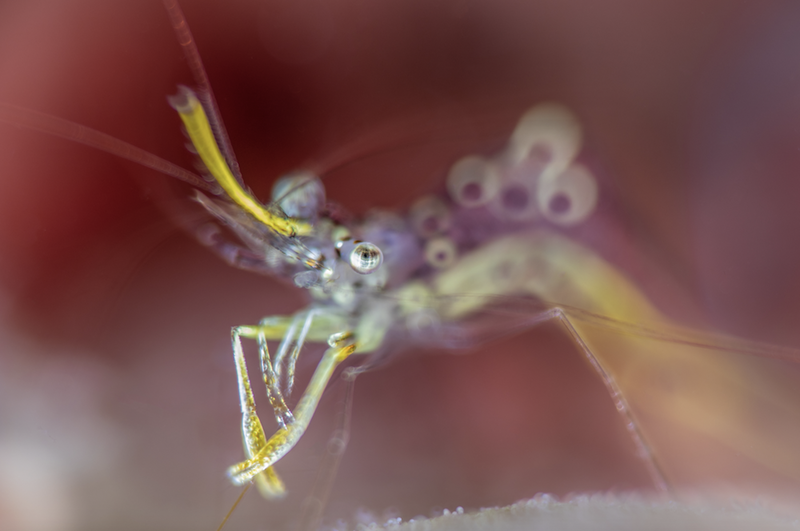 Lilian fell in love with the ocean as soon as she learnt how to dive and since then has been capturing incredible shots of macro marine life from South East Asia. Lilian has a particular passion for blackwater and bonfire diving where she is able to capture images of critters at their larvae stages – unseen by the majority of underwater photographers. Lilian’s aptly named “Black Magic” presentation gave participants and introduction into blackwater and bonfire diving photography – looking at some of Lilian’s incredible images one might almost suspect some element of Black Magic at work! There are two types of plankton; zooplankton (which is animal based) and phytoplankton (which is plant based). These two forms of plankton drift with the ocean currents and are the source of all marine life. The word “Plankton” is derived from the Greek word “Planktos” which translates into English as “drifter” or “wanderer”. 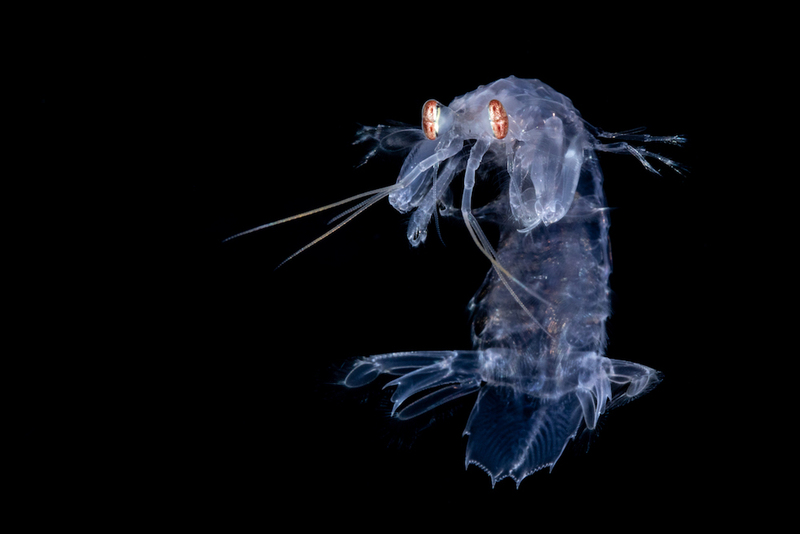 Did you know that in one teaspoon of sea water there are literally billions of life forms? What is Blackwater and Bonfire Diving? Blackwater diving takes place over deep water, away from the reef. In Lembeh we usually blackwater dive in the middle of the Strait. Bright lights are suspended in the water column at various depths up to 25 meters. 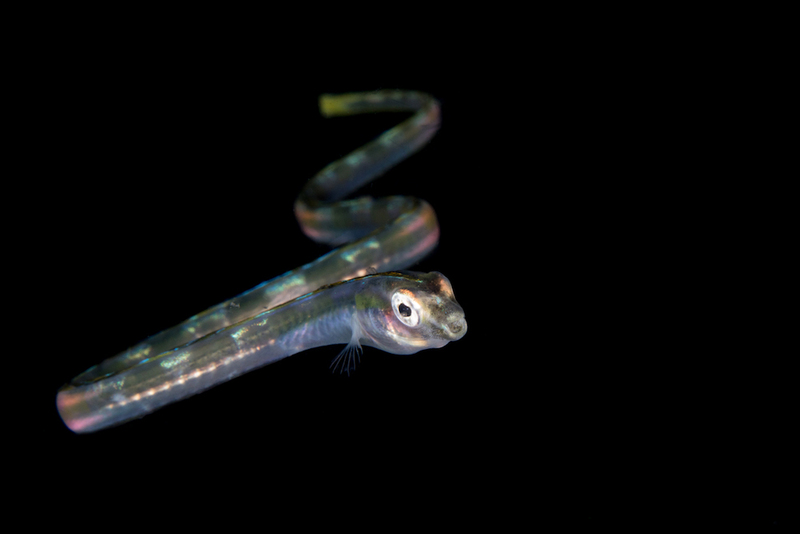 The lights attract plankton in the water column which in turn attracts intriguing and rarely seen larvae stage critters. Bonfire diving takes place at shallower depths on the reef or sandy slope – in Lembeh we have no shortage of suitable dive sites. Bonfire diving is also based around the use of bright lights to attract plankton and larvae stage and more mature critters. 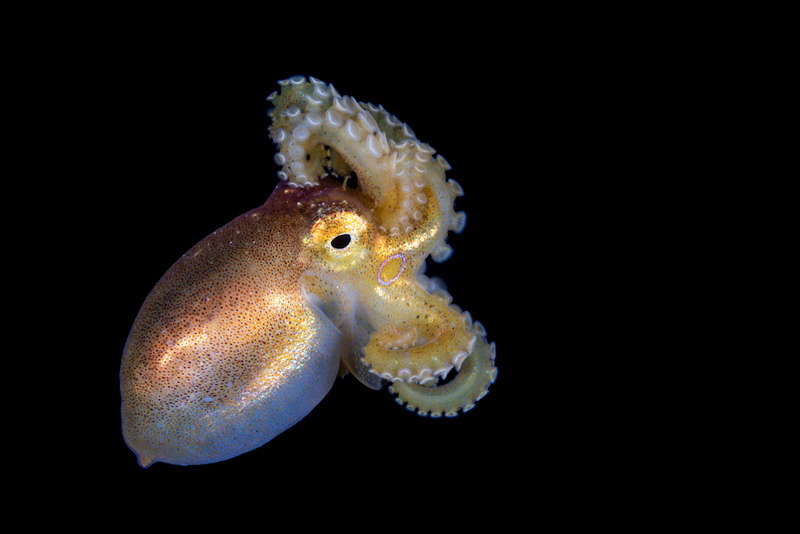 The most iconic blackwater and bonfire dive critters include crustacean and cephalopod larvae. Other common subjects include jelly fish and other critters which drift freely in the open ocean. Lilian reminded participants that many larvae stage critters are not yet displaying any coloration and are often translucent as they are still in the stages of development. 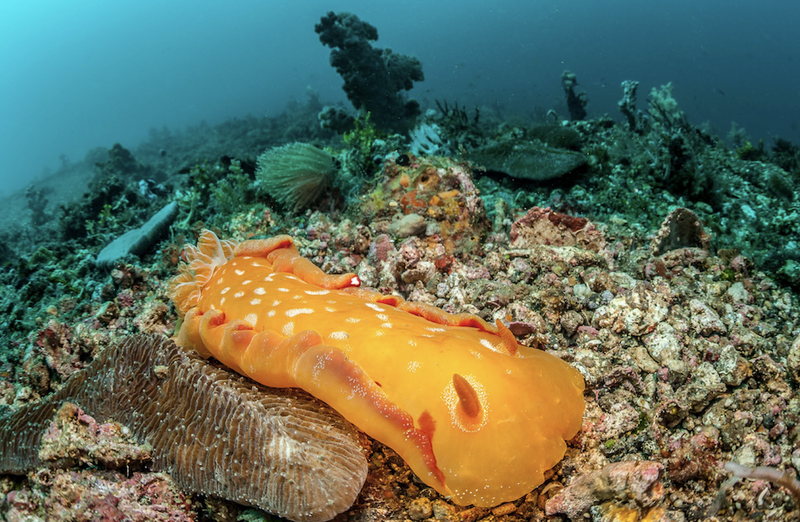 Both types of diving feature a lot of critter behavior spotting and imaging opportunities. Jellyfish are often behavioural hotspots, look out for jellyfish playing host to a range of species from tiny amphipods through to jackfish. 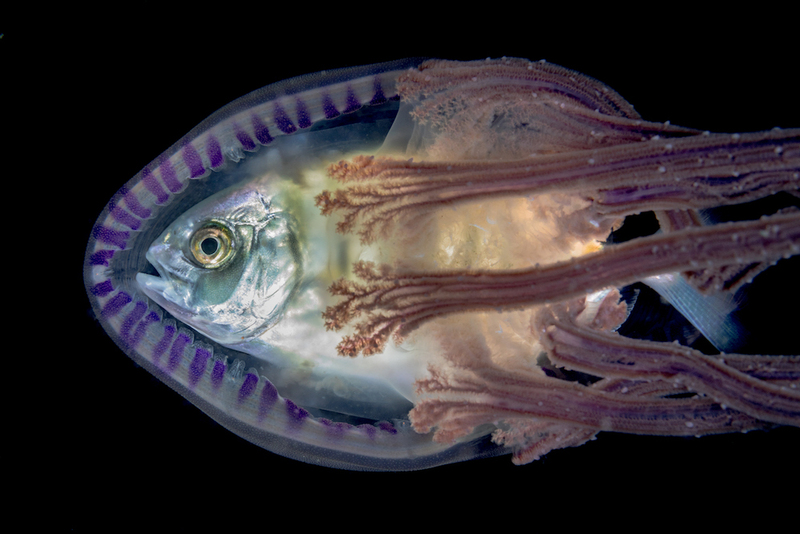 The jackfish will enter the jellyfish and use it for protection, it’s often possible to see the jackfish going in and out of the jelly fish as it exists it host to breathe before re-entering. This stunning image by Lilian Koh shows how jackfish and jellyfish will often travel together in symbiosis. Blackwater and bonfire photography require using fast shutter speeds – typically sync speed, as you are capturing images of larvae which is moving. A fast shutter speed will help to “freeze the action”. Lilian shoots with a small aperture which gives more depth of field and therefore allows for more of the critter to be in focus as opposed to a small section which is closest to the lens. 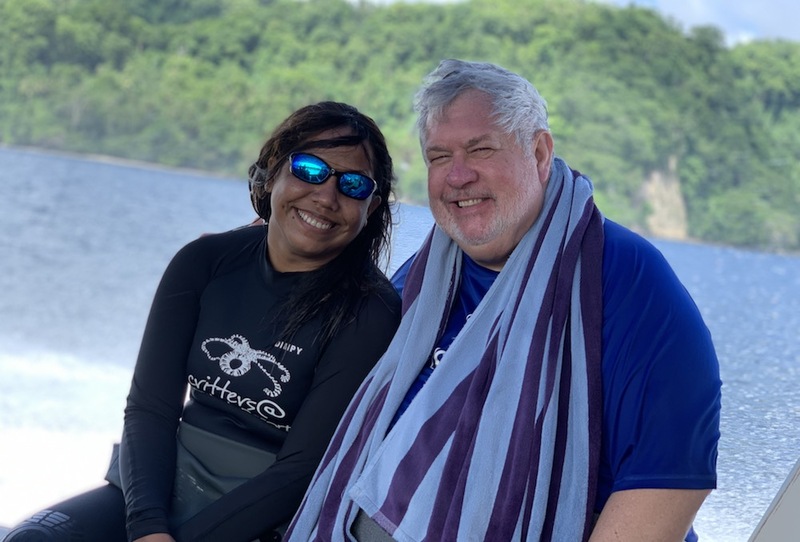 Lilian explained that it’s possible to blackwater and bonfire dive at any time but the most abundant dives are around the new moon – up to 4 days before and 3 days after. Around the new moon there is little moon light so the bright dive lights become more active. When there is a full moon there is already light on the surface so the level of activity is dispersed and less centered around the dive lights. 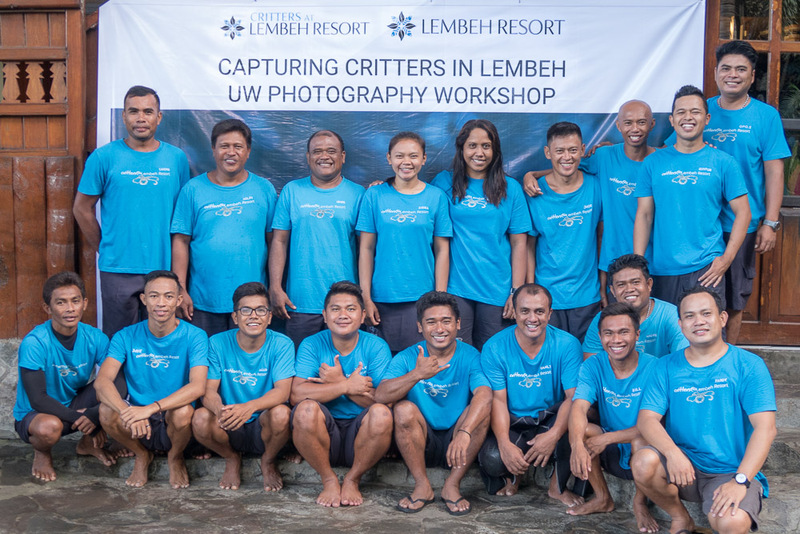 Last night marked the end of our Capturing Critters in Lembeh 2018 workshop. 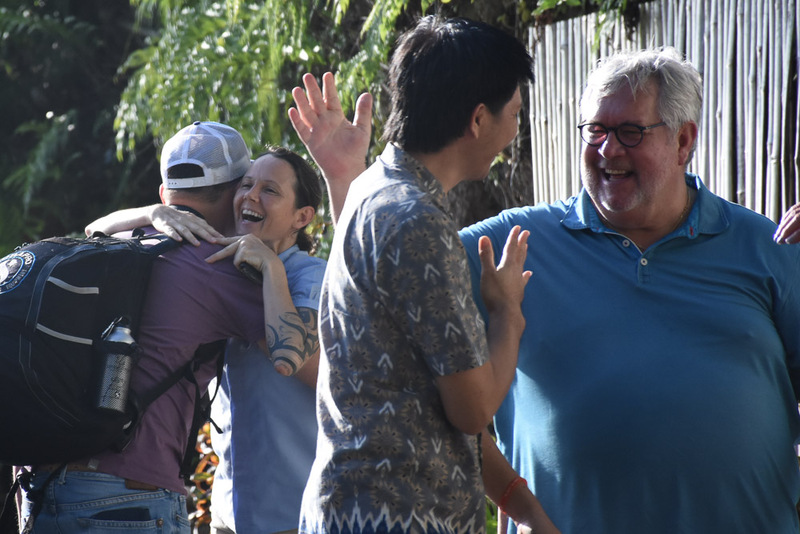 This morning we said farewell to some participants, while others are staying on for the three day advanced workshop which started this morning. It’s been another incredible year at Capturing Critters and our three Photo Pro’s have been on hand every step of the way for participants. 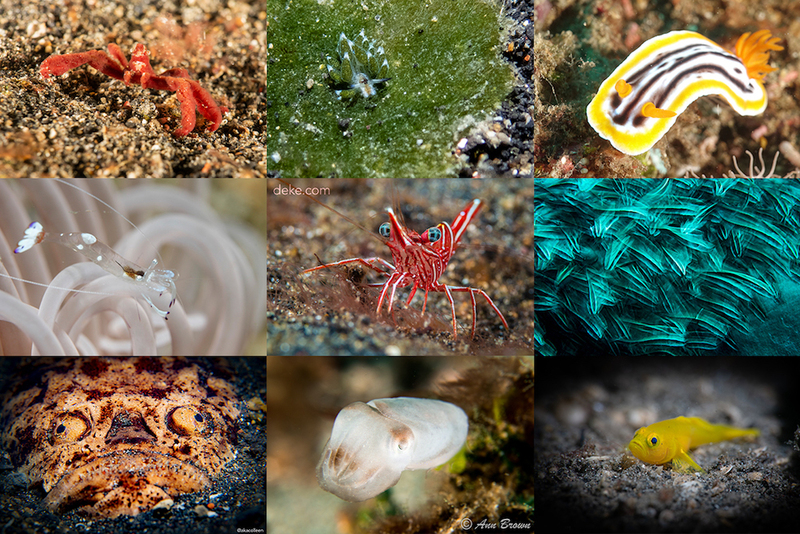 Our Dive Centre, Dive Guides and the entire crew have worked tirelessly to ensure the best critter and photo opportunities the Lembeh Strait has to offer. Workshop participants Stephanie and Paul Russel from the United States have seen a big improvement in their underwater video and still images over the course of this year’s workshop. 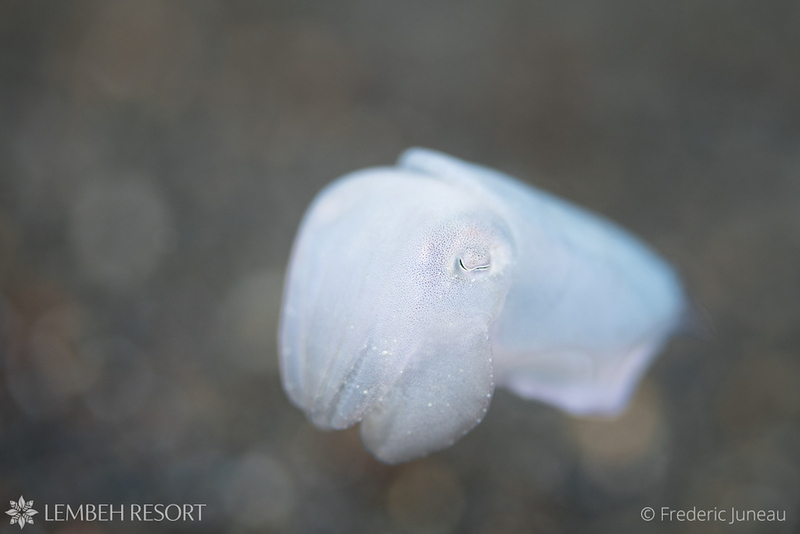 The above image was captured by Lembeh Resort’s in-house Marine Biologist Catherine “Dimpy” Jacobs during the Workshop. 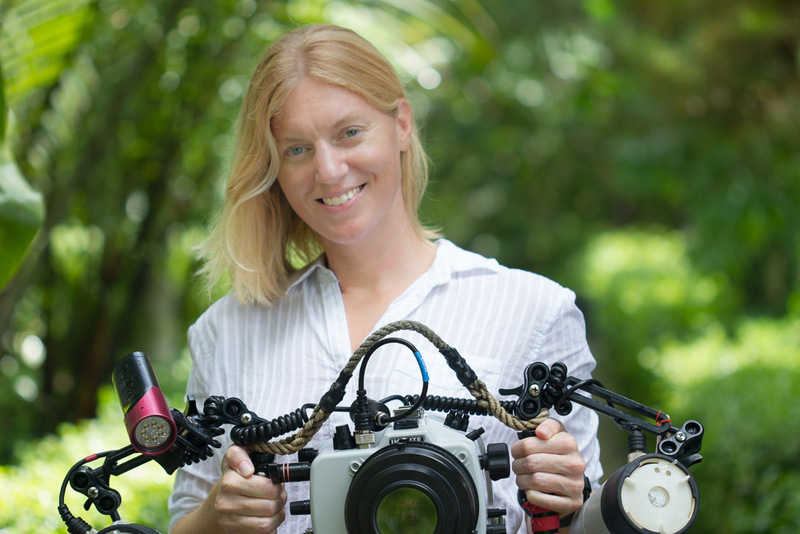 Photo Pro Brandi Mueller has been presenting this week on a range of topics as well as assisting participants underwater and capturing some stunning images of her own in the Lembeh Strait. The standard of images captured throughout the week has been nothing short of impressive and the quality of the images is a real testament to this year’s three Pro’s. Take a look at some of the images captured by our participants and Photo Pro’s below. 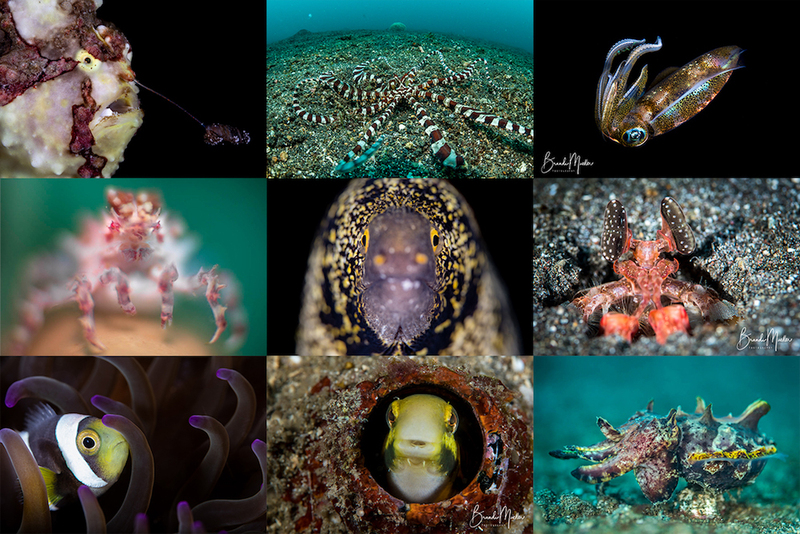 We are now in the advanced 3 day extension of the 2018 Capturing Critters in Lembeh Workshop and Tobias Friedrich’s “Close Focus Wide Angle” presentation revealed some of his most incredible underwater imagery. 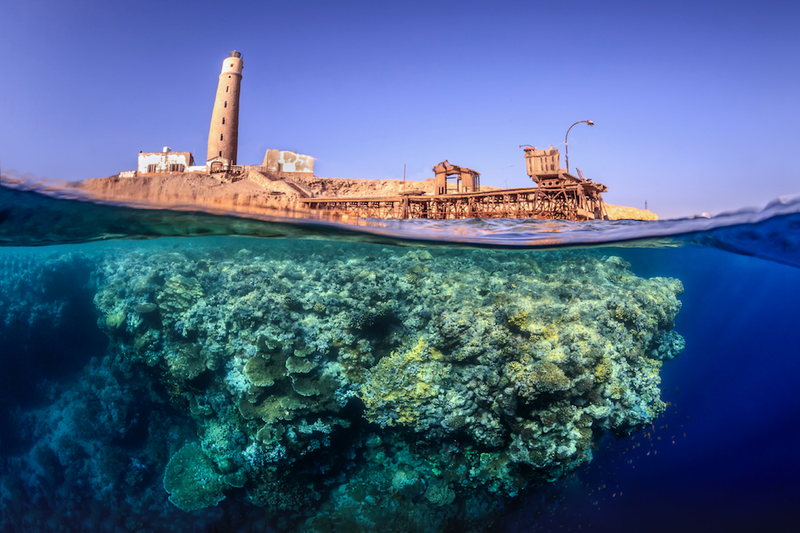 In order to return home from any dive trip with a varied and diverse portfolio of images, Tobias Friedrich recommends shooting with a wide angle set up for at least one day. Here he explains how to master this technique. 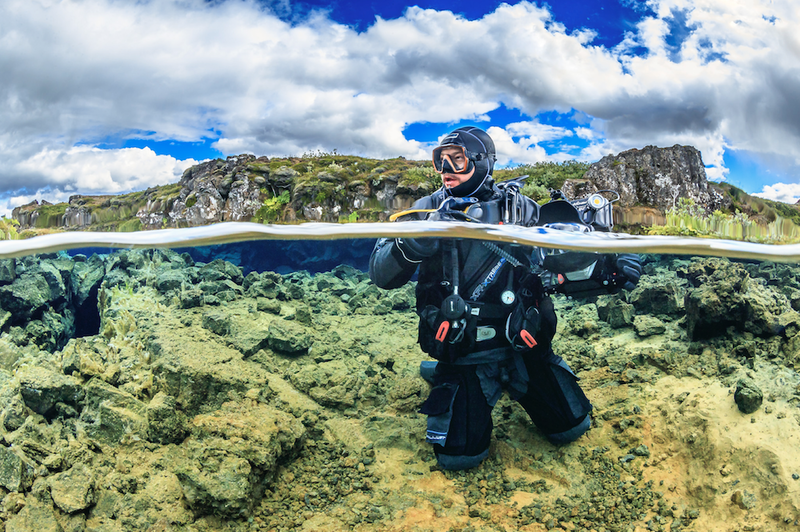 It’s important when shooting close focus wide angle images to make sure you are visiting dive sites which lend themselves naturally to this technique. Coral sites give the best results as the images will also include a portion of the bottom composition. 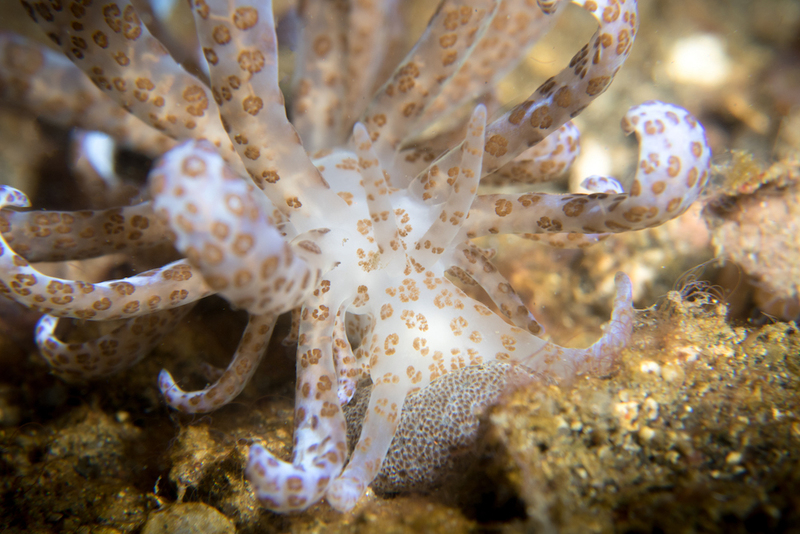 In Lembeh combination sites such as Nudifalls and Nudi Retreat are excellent, as are the reef dives at the North end of the Strait, around Bangka Island and the east coast of Lembeh. Wide angle shots are typically taken with a fish eye lens. When shooting close focus wide angle though a large dome port makes it difficult to get close enough to the subject; the best solution is to use a mini dome as this will give you a wide angle image and allow you to get close to your subject and focus from just a few centimeters away. When you do find the right subject, it’s important not to take a “regular” wide angle shot. In a wide angle image the entire image feels like a whole. In a close focus wide angle image you should have a 50 / 50 feel, almost like when looking at a split image. The idea is to capture a macro critter as the subject with a contrasting wide angle back ground – it’s this contrast which makes the image eye-catching to the viewer. 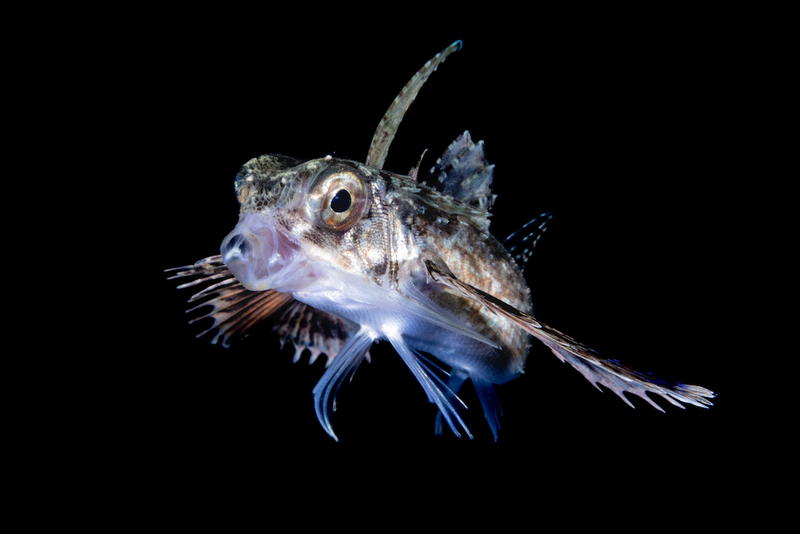 The rhinopias image above was captured by Tobias during the first dive when he spotted his subject. Tobias explained he was not altogether happy with the shot as so much of the bottom composition was included in the image. Tobias returned for a second dive where he was better able to position himself and shoot at more of an upward angle thereby eliminating a lot of the bottom composition from the shot and capturing more blue water behind (see image below left). When shooting close focus wide angle lighting can be tricky as you are so close to the subject it’s difficult to get light between the camera and the subject. Keep your strobes tight / close to the housing and a little bit back so light your strobes light cones actually hit the subject. Diffusers on your strobes help to diffuse the light so it’s not too hard on the subject – which will create a lot of shadows. 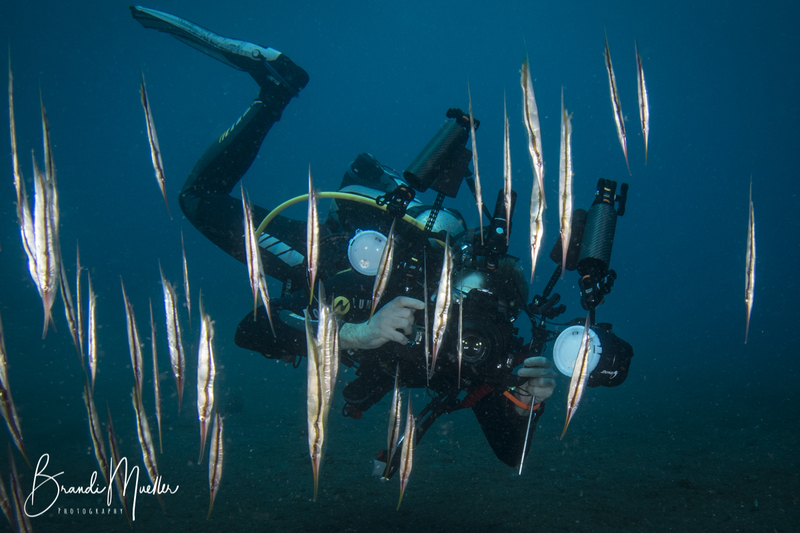 In Lembeh and at other sandy locations there is often a lot of backscatter when using diffusers but this can be removed during processing. When shooting close focus wide angle there are no fixed camera settings. Each image opportunity requires experimentation with strobe positioning and strobe strength until you find the right arrangement for each individual shot. Tobias recommends taking a test shot first and then building on it through a series of adjustments. If you are focusing on a close subject with a wide aperture your image will have blurring in the background which is not the aim of a close focus shot. Use a smaller aperture to give a wider depth of field and keep the background in focus. Although the background and the subject should be contrasting they should also compliment each other without the background becoming distracting from the main subject. The wunderpus pictured above does not show much differential between the foreground and the background. The contrast between the subject and the background is a key characteristic of a well executed close focus wide angle image. This image also demonstrates how much sand will be captured in the image when shooting from ground level. 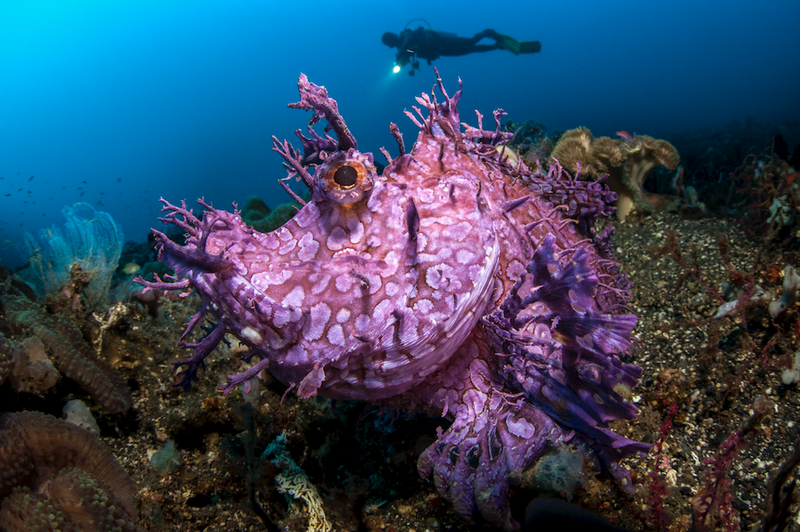 The orange frogfish pictured above was captured while sitting on top of coral which enabled Tobias Friedrich to shoot upwards towards his subject. This image shows a clear distinction between the colorful frogfish and the monochrome background of coral rubble. The more creative you are with your set up, the more risk you have of the shot failing but the more rewarding the shot will be when you get it right. Experiment with your set up. Be brave and try configurations you wouldn't normally use – it’s good experience to learn what can work. The more different things you try the more you will learn and the more rewarded you will be when it works. – Tobias Friedrich, Photo Pro. A good split shot tells a story which links the surface component to the underwater component. Split shots are often the most favored type of image by non-divers because they can relate to them. Whereas a non-diver may find it difficult to connect with an underwater image of a rhinopias, they can relate to surface images and a split shot allows them to connect what they see on the surface to what lays directly beneath it. Split shots bring the underwater world into a relatable reality. Finding the right location for a split shot is key – and it can be challenging. You need a beautiful underwater environment as well as an interesting and recognizable surface element which tells the story of where the image is taken. – Photo Pro, Tobias Friedrich. When trying to capture split shots, a dome port is essential, if you are using a compact camera, it’s possible to buy domes which fit to the front of the housing. 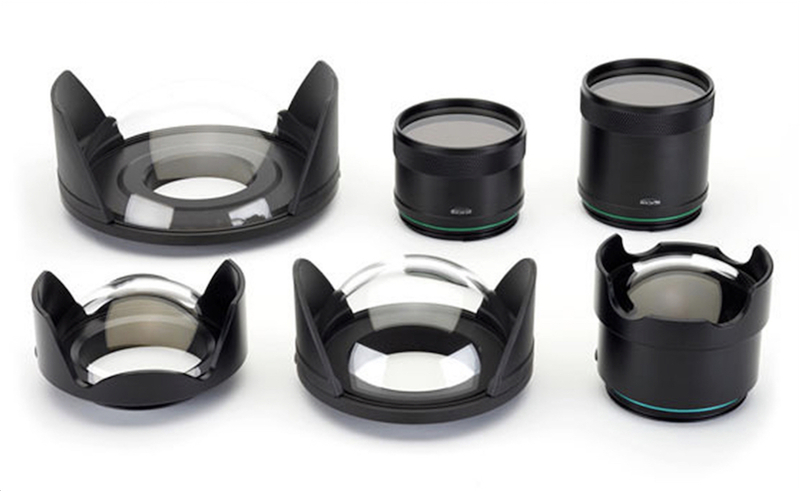 Dome ports have a larger surface area which makes creating a split shot easier. The larger the dome, the easier it is to shoot. 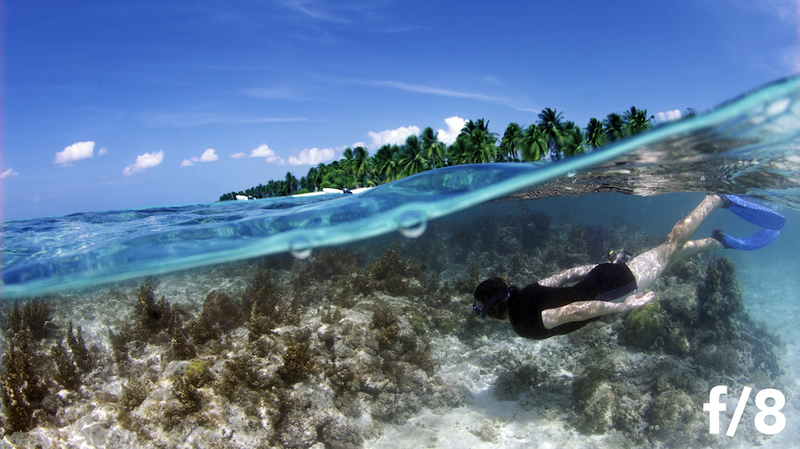 If there are waves on the surface then taking a split shot with a small dome or no dome becomes almost impossible. Fisheye lenses will give even wider coverage than a wide angle lens which makes a fisheye lens extremely useful when trying to capture split images. Water droplets will often form on the top half of the dome which is not submerged. An anti-fog spray will ensure droplets run off the dome but they are not effective for long. Using spit (as you do in your mask) on the top half of the dome also works but it will also need re-applying after each set of shots. Split shots come with their own lighting issues. As the sunlight breaks on the surface it bends which makes the underwater section of the image appear very close and the surface component will appear further away. If you use a large aperture you will capture the underwater scene in focus, however, the surface part of the image (which appears further away) will be blurry as in the image above which Tobias Friedrich shot at F8. To maintain focus throughout both halves of the image, shoot with a smaller aperture. 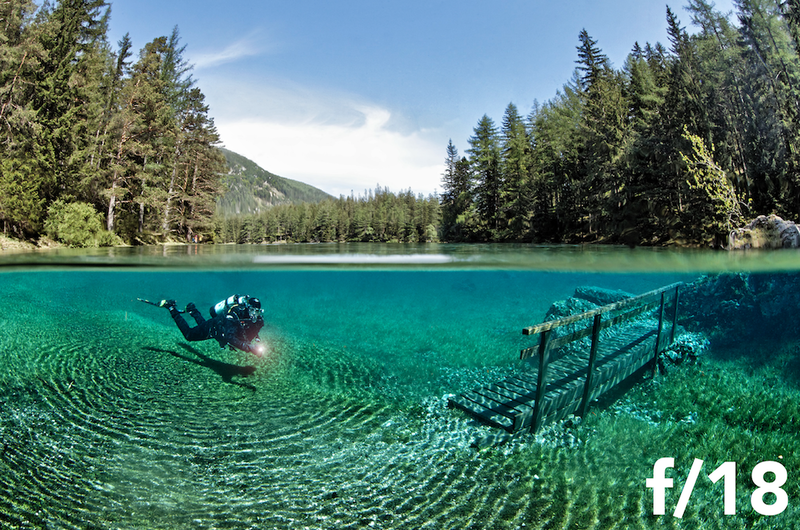 Start by getting the underwater section crisp and with a smaller aperture the surface should also be in focus. Tobias shot the image below with a smaller aperture (F18) and achieved focus both above and below the surface line. 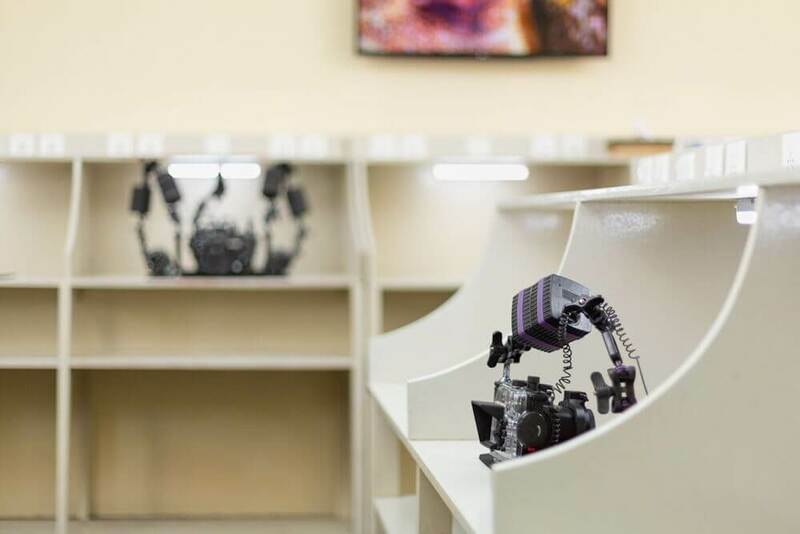 Depending on the effect you are hoping to create you can hold the camera lower and shoot up to capture the underside of the surface or raise the camera up slightly and shoot down to capture the top side of the surface. 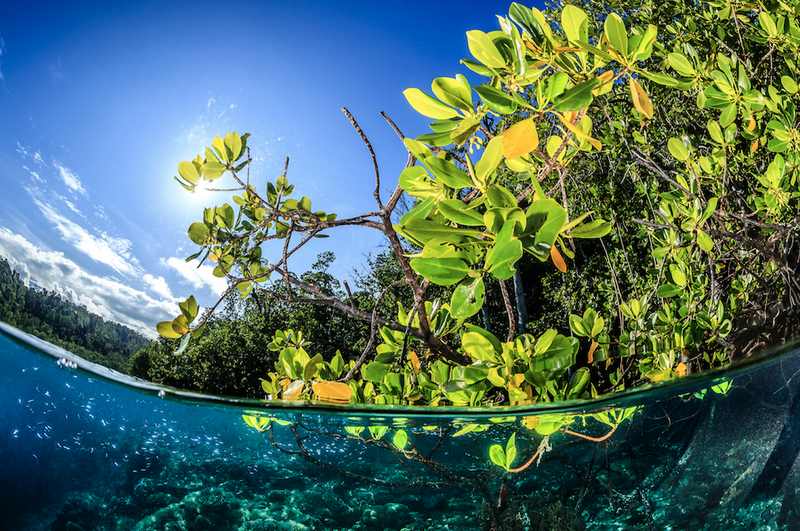 Think about where you want to place emphasis – the mangrove shot (above) puts more emphasis on the top side of the story – with the camera angled up more. If you shoot angled down then the emphasis will be more on the underwater story. 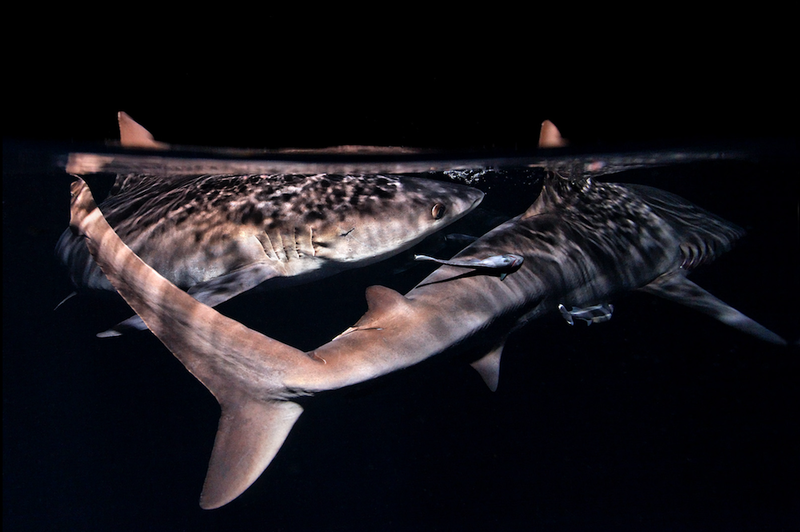 Split shots do not necessarily have to be two distinct halves, it’s possible to link surface and underwater stories through “cross over” subjects such as in the diver image above and the shark image below. When there is not an attractive or meaningful background on the surface, sky backdrops or sunset backgrounds can work well. If using either of these techniques the focus of the image will be the underwater aspect and apertures can be varied to ensure a crispy underwater component. 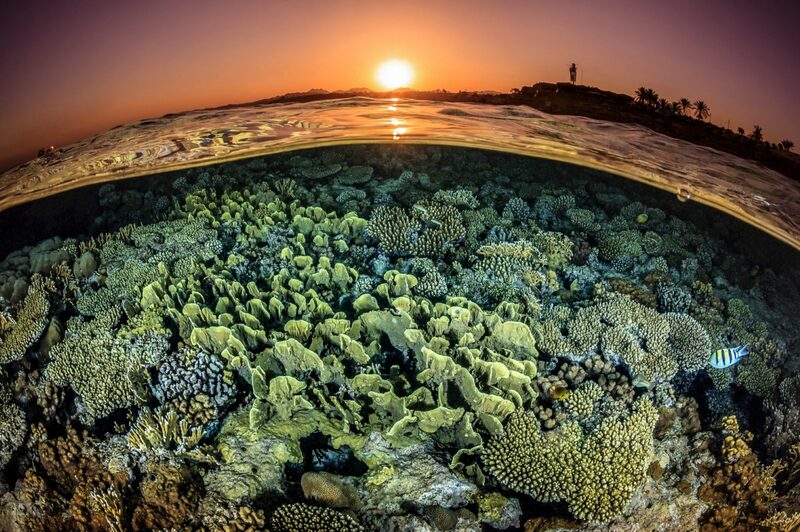 If you are shooting a sunset you’ll need strobe lighting to illuminate the coral. Position the strobes wide off the side of the camera from the surface and aimed down. 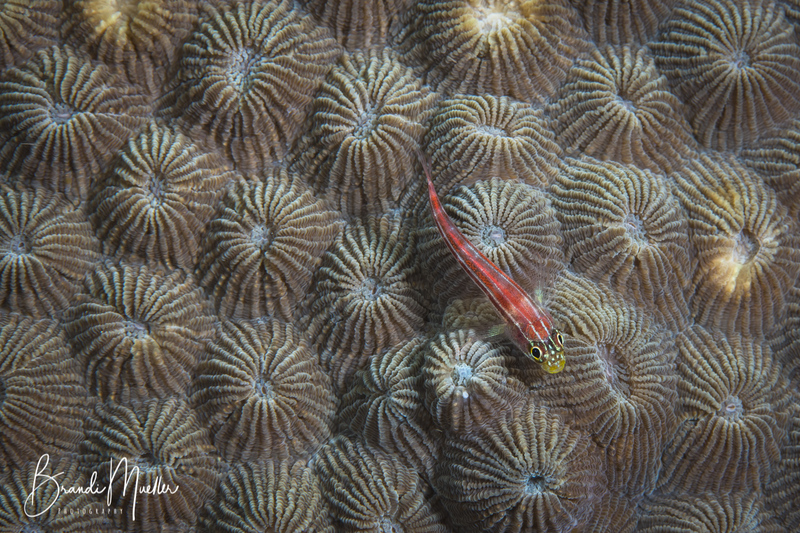 If you put the strobes underwater, below the camera, the artificial strobe light can be very harsh on the corals. When shooting split images during daylight hours, aim to take your shots with the sun behind you so it acts as a natural strobe (ambient light). Try to get a few different shots from different angles, don’t just do the same shot again and again. It’s important to explore various options and keep asking yourself “What more can I do? How can I improve the overall picture? Which new perspective can I try?” It’s only through experimentation that you learn and get better. – Photo Pro, Tobias Friedrich. 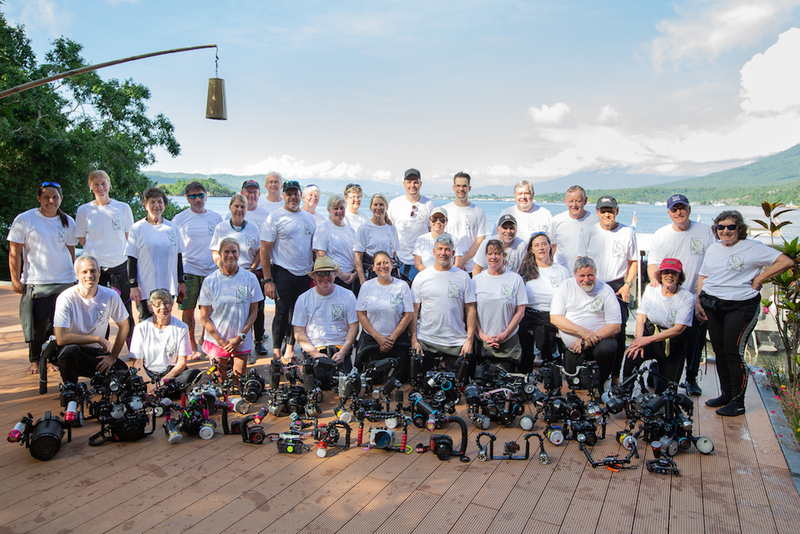 OUR 3 DAY ADVANCED EXTENSION DRAWS TO A CLOSE TODAY – THANK YOU TO ALL PARTICIPANTS, PRO’S AND STAFF WHO HAVE MADE THE 2018 CAPTURING CRITTERS IN LEMBEH WORKSHOP SUCH A PHENOMENAL EVENT!